Major advances in RNA-Seq technologies lead to an high growth in the collections of gene expression profiles data. In order to shed light on biological and medical questions, automatic knowledge extraction methods are becoming essential. Here, we present GELA (Gene Expression Logic Analyzer), a novel tool able to perform a knowledge discovery in gene expression profiles data of RNA-Seq. In particular, we introduce the RNA-Seq technologies, we illustrate the gene expression profiles analysis method, and finally, we test our knowledge extraction algorithm on the public RNA-seq dataset of Breast Cancer, obtaining promising results. For the input file, follow the description below. The parameters needed for the correct running of GELA is a file in DMBCSV format. You can find diverse offline versions of GELA here. 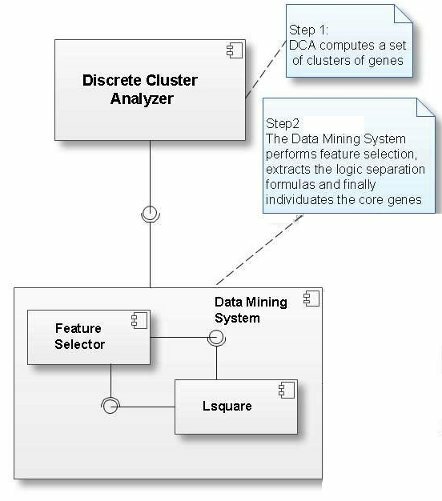 The GELA software system implements the methods described above: clustering, feature selection and logic formulas extraction. Below you can see the component diagram of GELA.